of Gatorboard and Kato Unitrack. The lowest level on my new layout is a 10-track staging yard and I wanted to ensure that I had great access to the trains there in case of problems and for any maintenance such as track cleaning. Some quick testing led me to realize that I would need at least 6 or 7 inches of clearance above the staging yard and below other track levels to ensure I could reach the tracks at the back of the yard once the layout was complete. The smaller size of the layout meant that I would not be able to gain that height without using a helix. 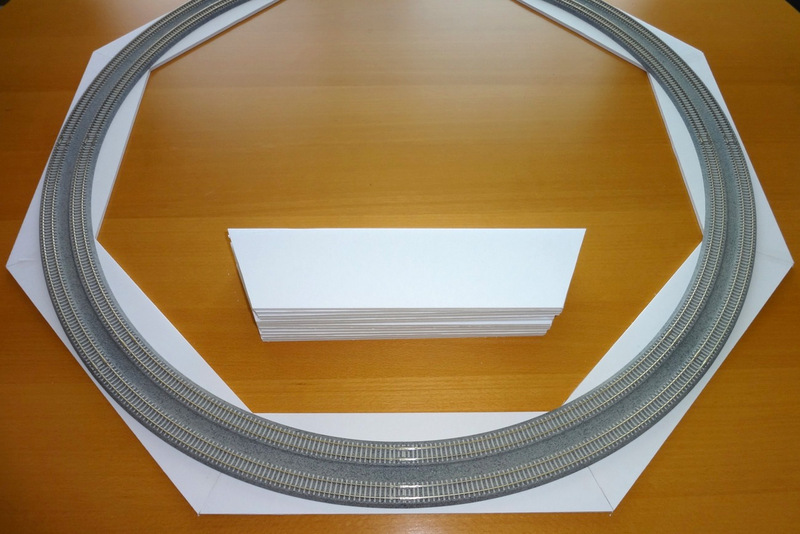 I already had a fair amount of Kato Unitrack curved double track sections I had picked up for my previous layout (although they were not used) and the radius of those track sections was perfect for the space I had for the helix. The sectional Unitrack would also make it much quicker and easier to construct the helix. 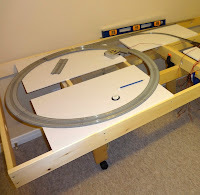 On past layouts I had built my own helix out of thin plywood and had used the great helix kits from Noch but in keeping with my lightweight goal I wanted to try to see if Gatorboard could be used to build a strong but lightweight helix. To start I used some basic math to calculate how much height I could gain with each helix turn with a 2.5 percent grade. I had planned the staging and helix so the trains going up the helix would be using the outer, wider radius track (and therefor the lower grade) of the two so I used that radius for my calculations. 102.8" at 2.5% grade = ~ 2.6" height gained per turn - using Rise = (grade/100) * run. 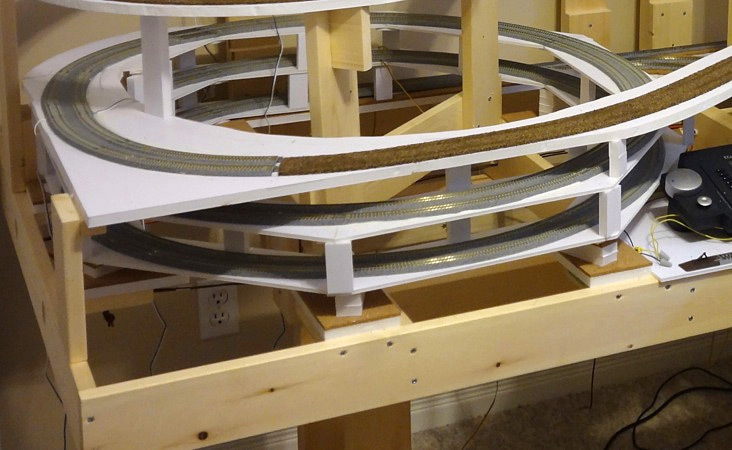 The 16 3/8 inch radius of the helix meant that a 2.5 percent grade would leave me rail to rail difference of 2.6 inches. To gain 6 inches of height this means I would need to build a 2 and a half turn helix. I choose to use 3/16 thick Gatorboard (vs the 1/2 inch I used elsewhere) as the base material for the helix in order to keep the clearance between levels as great as possible. In order to minimize the amount of waste material when cutting the sections of the helix I decided to use a trapizoid construction for the helix rather than cutting curved sections. I used the basic method and modified the Excel sheet found at http://www.stayathome.ch/gleiswendel.htm to calculate the pattern dimensions. 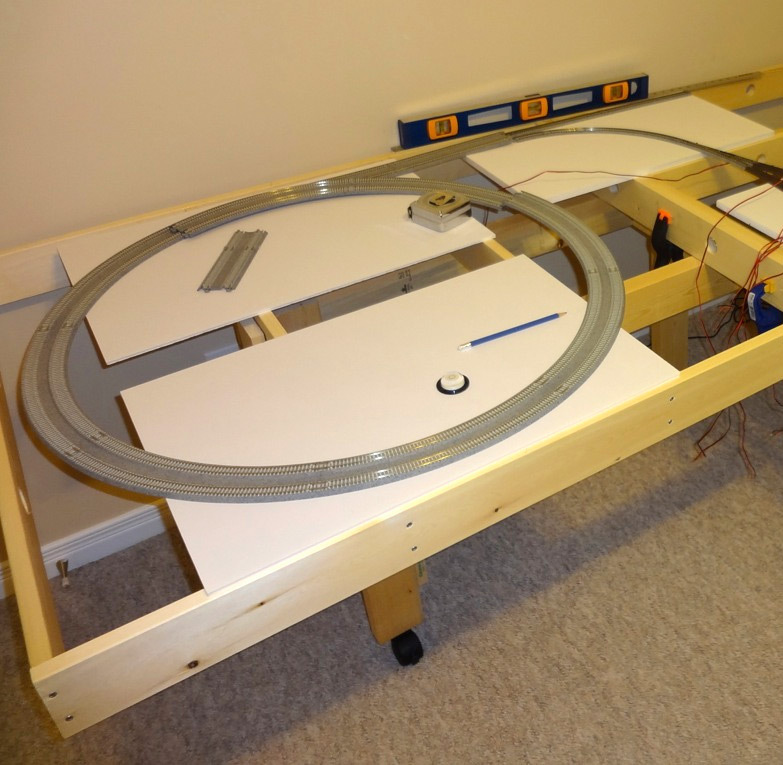 As the Unitrack roadbed would provide extra strength when attached to the Gatorboard I did not build the helix with overlapping sections at the link above but chose to use short pieces of Gatorboard as joiners to attach the sections together. Adding the 1st level onto the supports. Once I had cut the Gatorboard into a stack of trapezoidal sections I laid out them out on the benchwork and added some Gatorboard and cork (to help dull any noise) support platforms to the benchwork at each joint/corner. 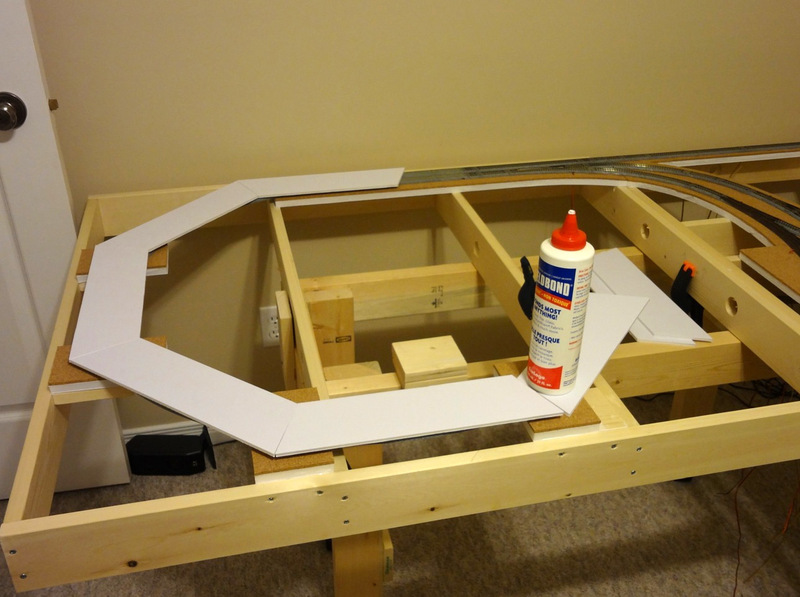 I used pieces of different thicknesses of Gatorboard to support the first layer (the thicknesses worked perfectly) and cut 1/2" sections of Gatorboard as risers to support the upper level. I used my favorite Weldbond glue to assemble the Gatorboard pieces and attached the Unitrack as I went with adhesive caulk, ensuring I added track feeders for each turn of the helix. 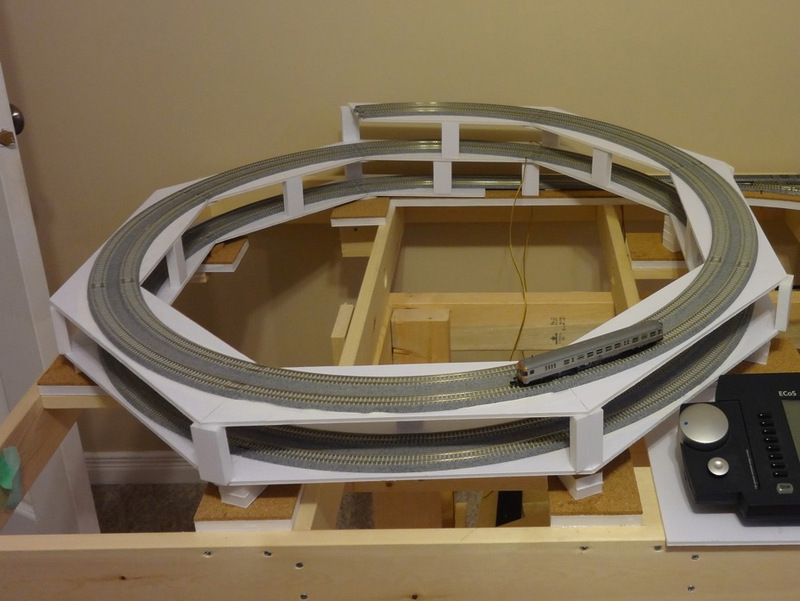 I took a break from construction after the first turn was complete and temporarily hooked up the track to my ESU ECoS command station and ran a number of test trains from staging to the helix to ensure the trains I wanted to eventually run could handle the 2.5% grade. Even my my smaller and lighter locomotives were able to handle appropriately sized trains so I continues with construction. Testing also help me find and fix a section of Unitrack where one track joiner had fallen off during construction (leaving a section of track dead) before the helix was complete! I ended up building 2 1/4 turns of the helix this way and in the end was very pleased with the results. Going in I was not sure Gatorboard construction would provide the strength for a important layout element like a helix. If it I was not happy with it I was ready to rebuild it with a thin plywood base but the end result turned out to be far stronger than I had hoped for and also extremely lightweight. Using Gatorboard and Kato Unitrack allowed me to get the helix built in probably half the time it would have otherwise taken me, with little or no compromise on strength. The finished 2 1/2 turn helix showing the transition area from the Kato Unitrack to the cork roadbed (flex track not yet laid). The last 1/3 turn is built on 1/2 inch Gatorboard for additional stregth.